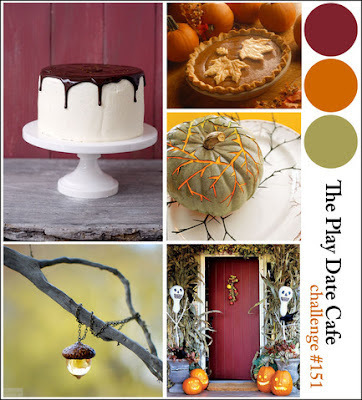 This is the first time that I have created a card for a challenge at The Play Date Cafe. When I saw the colour inspiration for this week my heart skipped a beat--isn't it gorgeous? It is Thanksgiving this weekend in Canada and I still have a few cards to finish up so the two combined made for play time. and that strip of medallions is perfect!! Oh, this is a gorgeous interpretation of those colors. You reminded me of how incredible that medallions background stamp is. I had no idea Thanksgiving was so early--Happy Thanksgiving! Holy cow your card is amazing!!! The colors are great and I LOVE your layered flower. And the background stamping is perfection. Beautiful card!!! Happy Thanksgiving! So beautiful and those colors, so soft and peaceful. Happy Thanksgiving to you and your family! Great job with these colors! Love the medallions in these colors. So pretty. That's an awesome take on the challenge, Tracey! Love the felt flower and the border treatment! Gorgeous! They are really yummy colours and I love how you've used them. Those felt layers are perfect! Well, we're so very happy that you joined in the Play Date Fun! You absolutely rocked the challenge! I LOVE the stacked feltie goodness! Thanks for playing with us at The Play Date Cafe! Beautiful card Tracey! I love all the wonderful texture with the background medallions. Happy Thanksgiving! Gorgeous use of those rich colours! I love that you added the cozy felt - makes the whole card feel very 'warm'! Georgeous card. 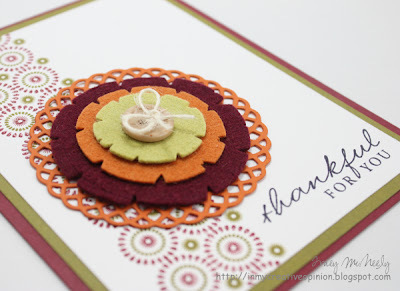 Your notched flower with the doily looks great on the medallion background.I too love those colors! Tracey, this is so fabulous! You did a great job with these colors! The doily die looks great behind the notched flowers ~ using the felt really adds to this card! Tracey, this is incredibly beautiful! Love the colors too!